The opening game of the Ladies senior football championship was a hard fought, closely contested affair. The Shamrocks pulled out the win in the final 10 minutes of a game that was neck and neck all the way through. If this is a harbinger of things to come it should be a keenly contested title this season. 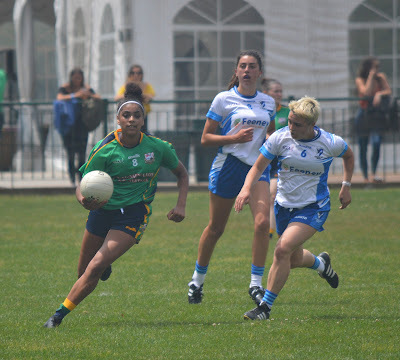 Katie Black on the move for the Shamrocks. There was a point between the teams at the end of a hard fought first half. A Nicola Judge goal following a great downfield run from Kelly Jordan put the Shamrocks into an early lead. The Shamrocks were full of running, with players from the half back line leading the charge. Laura Kieran was first to everything in her area of the field, and Katie Black in the middle of the field won plenty of possession for the Shamrocks cause. Connacht Ladies had Jane Ward at center forward on hand for the first 2 points as play followed up and down the field. Ward swung over two points in her with characteristic style. The Shamrocks held on to their edge for most of the half, but were guilty of dropping several shots into the hands of Connacht keeper, Rachel O’Driscoll and hit the post on 2 occasions. A late goal from Ward put the westerners into a one point lead just before the break. It was a well worked move with Jackie McDonagh providing the assist. Connacht Ladies a point to the good, 1-4 to 1-3 at the end of a great half of football. Shauneen McAleer looks for options. The second half saw the Shamrocks regain the lead. After Ward pointed for Connacht, a goal sandwiched by 2 points put the Shamrocks 3 to the good. It was a well worked score with Jordan applying the finishing touch from close range. The Connacht Ladies fought back with Catherine Boyle at center back and Triona Kelly at wing back providing the platform for several attacks. Ward pointed expertly three times on the trot to level the scores. Any hint of room and the ball is over the bar. With 15 minutes to go it was anybody’s game. Niamh Harney and Chloe Baker were busy in the Shamrocks forward line. Baker took a lovely point and was followed by a wonderful Kelly Jordan effort. The Shamrocks proceeded to push home their advantage as others stepped up when tired legs claimed a number of their teammates. Judge made it a three point edge with the clock ticking away. A goal was needed for the Connacht Ladies to salvage a point, but with Cathy McEleaney fighting a hard rearguard battle, the Shamrocks kept the door closed. First blood to the Shamrocks. 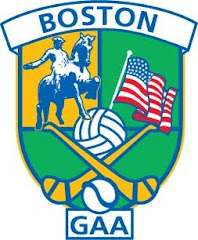 Shamrocks: Barbara Kelly, Allie D’Amico, Cathy McEleaney, Roisin Hession, Kelly Boyce Jordan, Laura Kiernan, Katie McGovern, Katie Black, Niamh McLaughlin, Oonagh Sheilds, Nicola Judge, Niamh Harney, Chloe Baker, Louise Desmond, Ciara Murphy. Connacht: Rachel O’Driscoll, Siobhan O’Sullivan, Shauneen McAleer, Stephanie Finn, Triona Kelly, Catherine Boyle, Kim Cobbe, Aoife Heffernan, Aisling Kerr, Jackie McDonagh, Jane ward, Colette Folan, Joanne Conroy, Emer McHugh, Rachel Tubirdy.